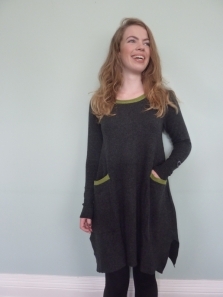 An easy-to-wear on trend colour block cashmere tunic or could be worn as a dress. Simple, slightly flare shape, loose sleeves with delicate curled hem on cuffs and neck edge. 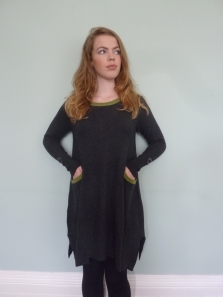 A go anywhere tunic. This style is on the large side. Charcoal with Frost Fleck contrast. 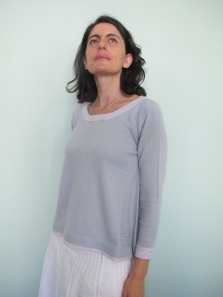 Muir & Osborne design women’s luxury knitted cashmere clothing. Using the finest luxury cashmere from Mongolia, the cashmere knitwear is made on looms, finished by hand and every piece is hand embroidered with our recognisable wreath. The patterned cashmere knitwear is hand knitted in 2 ply cashmere in the UK.